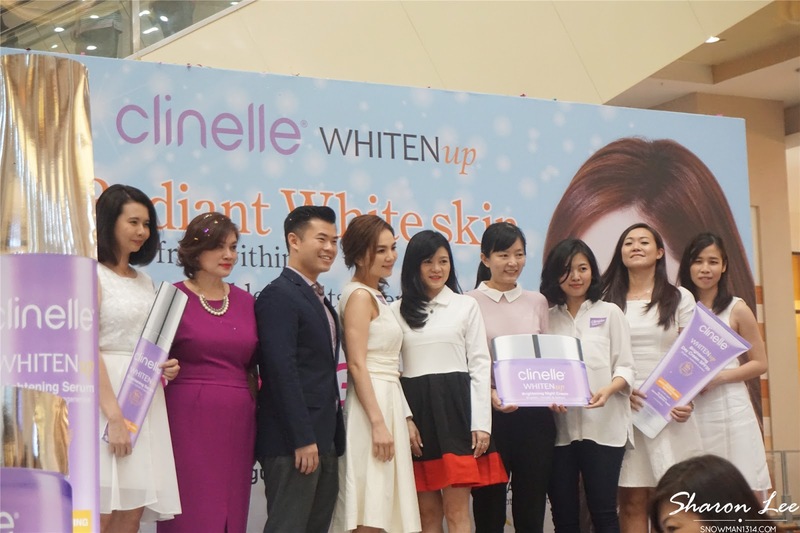 Clinelle has finally launched its new improved Clinelle Whitenup Brightening rangde. This time Clinelle is honored to invite award-winning and international icon Ella Chen, who is Clinelle brand ambassador more than 3 years to officiate the launch along with distinguished VIPs, media & guests. 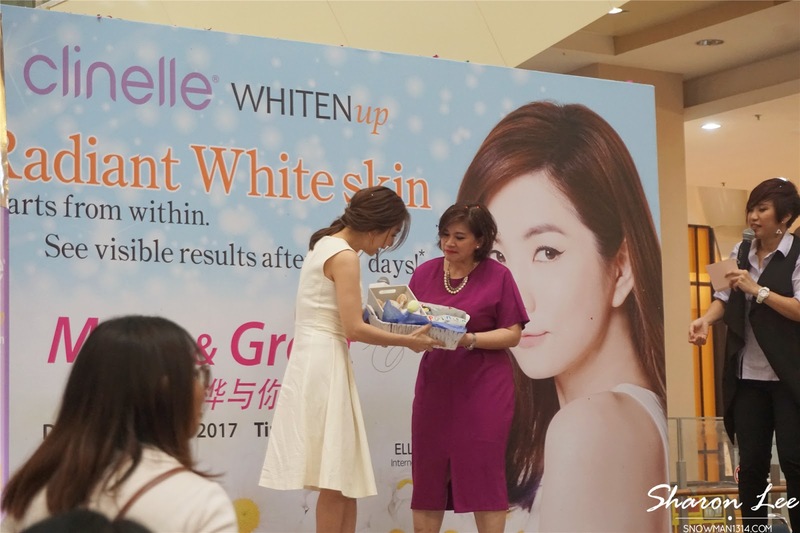 I am lucky and honored to attend this officiate launch and see Ella Chen in real life. 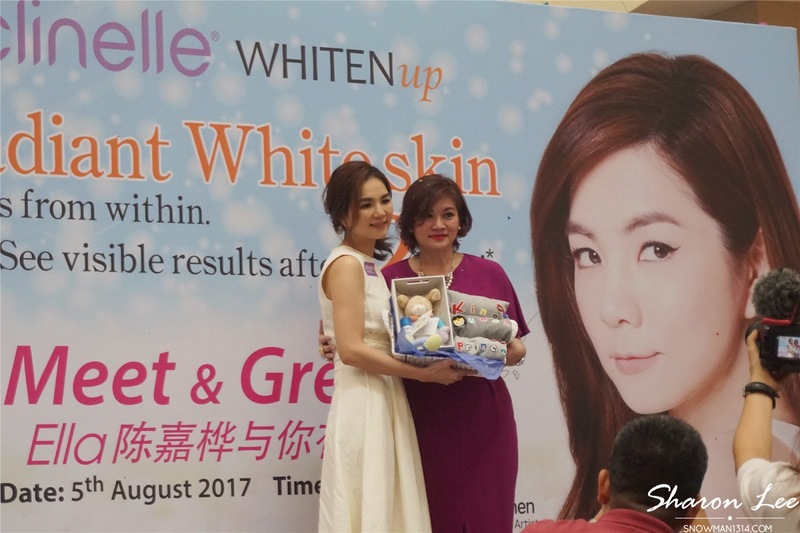 Ella Chen is profoundly excited to make her first official public appearance in Malaysia since she has given birth. 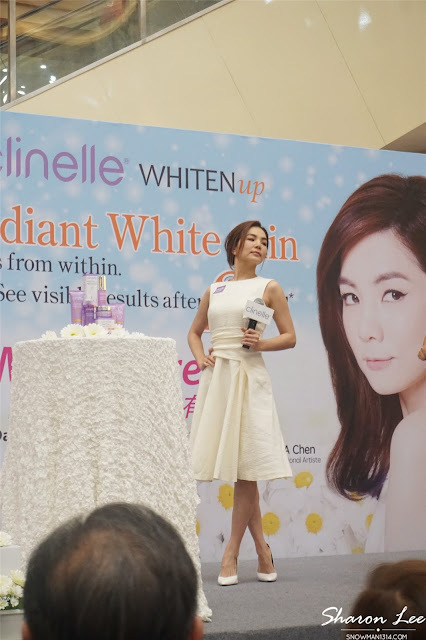 Speaking about the brand, Ella Chen said, " I absolutely love the newly formulated Clinelle Whitenup Brightening range. The Products protect my skin from day and night, regardless of being indoor or outdoor. I am amazed by the visible results after just a few days usage, my skin looks glowing, brighter and spotless. 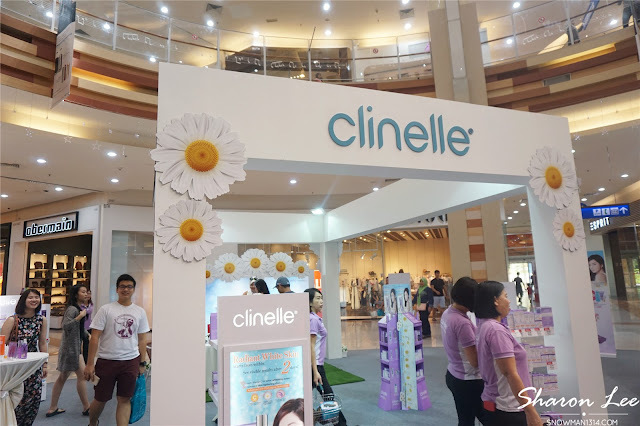 I strongly recommend Clinelleskincare as the brand is devoted to delivering good skin care infused with skin-friendly natural ingredients yet effective. At the same time, it excludes potential harmful ingredients with its 7 no's philosophy. Our skin is our canvas. Nothing makes a woman more beautiful than the confidence that comes from having spotless, brighter and fairer skin. The ideal skin of every woman's dream!" 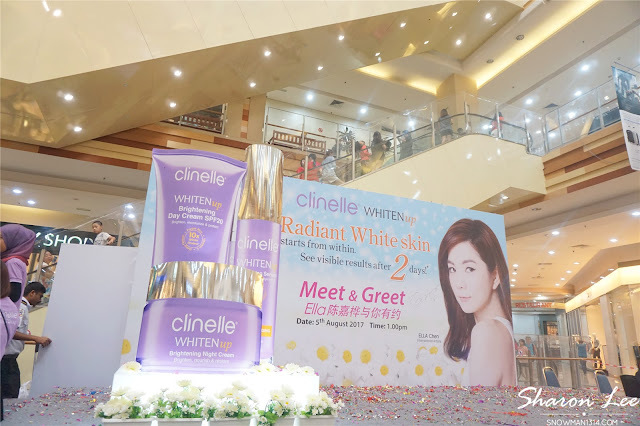 Fans of Ella Chen are eagerly waiting for her arrival during the event launching. Q&A session and give away prizes to those who manage to answer the question. A little warm up session before the event starts! Finally, Ella Chen is here! I can just describe her as mischievous, cute and funny on stage. She poses a lot funny and exaggerates pose when she's talking and describing. So funny that I couldn't even stop laughing! In this new range, Clinelle has also added an additional ingredient which provides exceptional benefits for brightening efficacy - The Great Mullein Flowers in the formulation for Whitenup Brightening Night Cream. Empowered by the cultivation of Great Mullein FLowers with Advanced Anti-Photoaging Technology, it helps to protect our skin from harmful UV rays while at the same time transform them into a beneficial light source for a youthful glowing skin. What's Ella favorite Clinelle Whitenup Skincare product? She mentioned that she never knew that electronic gadgets like mobile phone, iPad or TV are capable to release harmful UV rays to damage out skin at night! It's become inevitable to avoid using electronic gadgets in our daily life because it has become a necessary part of our lives. With the new Clinelle Whitenup Brightening Night that contains Great Mullein Flower with Advanced Anti-photoaging Technology to provide high protection against UV damage and also continuously absorb harmful UV radicals to transform into light that glows from the skin within. She uses the cream every night and awake to beautiful glowing skin the next day! She also shares her skin care routine with Clinelle Whitenup Range product day and night. She does a demonstration on stage with the face model too. Even though after giving birth, there's a saying that pregnant woman tends to forget easily. But Ella is able to mention all the products from the range and the special ingredients in it! 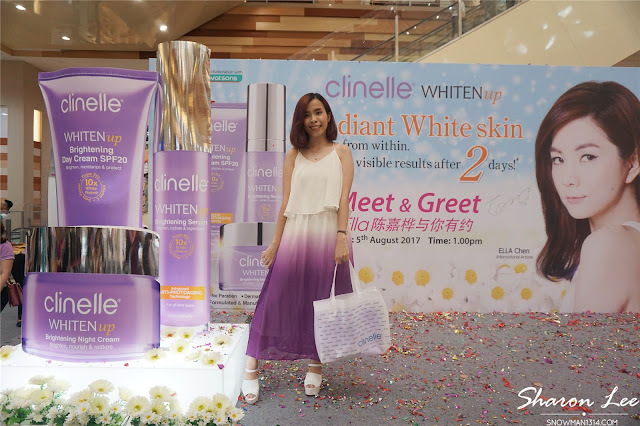 Winners from Clinelle #RadiantWhiteSkin Competition! Clinelle also prepared a gift for Ella, a gift for her whole family including her first born baby in the family too. Not only that Ella Chen also take a group photo with all her fans from Malaysia too. Manage to catch a glimpse of her husband too that waiting outside for her. My Outfit of the day! Matchy Purple and White with the theme. 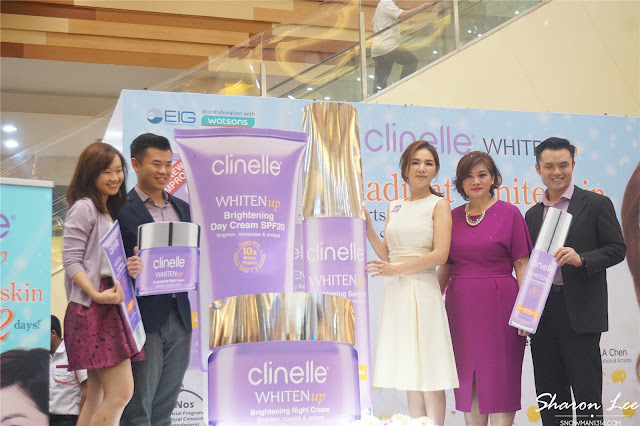 This time Clinelle incorporate an innovative approach to create technology-inspired beauty and esthetics solutions, featuring Advanced Anti-Photoaging Technolgy with 10X more White Protect and 3X increase in Lightning Power. The breakthrough technology-empowered with 3 key ingredients work synergistically and effectively to penetrate into the deepest skin layers to deliver fast, targeted and unprecedented brightening effect. Skin is beautifully transformed into unparalleled radiant, white after 2 days! 💜 Japanese Purple Rice Extracts, which is a precious ingredient that helps enhance the efficacy of Vitamin C to promote fairer, firmer and moisturized skin. 💜 Vitamin C knows as a powerful antioxidant to redefine skin texture and lighten skin tone. The new formulation contains 10 times more lightening effect to the existing range. 💜Daisy Flower Extract step in to prevent skin darkening for longer lasting brightening results, it helps reduces pigmentations and evens out skin tone effectively. 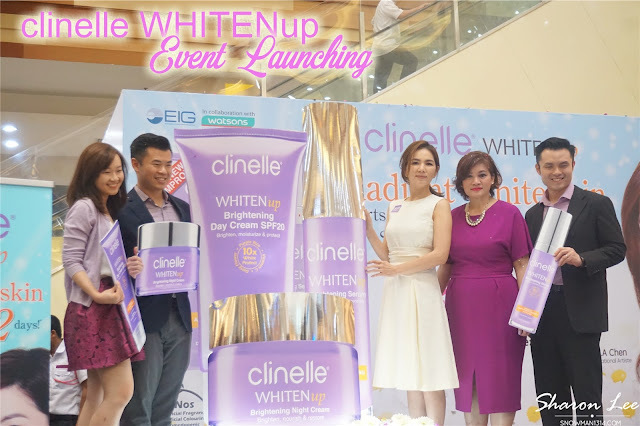 Clinelle WhitenUp Brightening series is available at AEON Wellness/Supermarket, Caring, Guardian, Watsons & selected independent pharmacies nationwide. 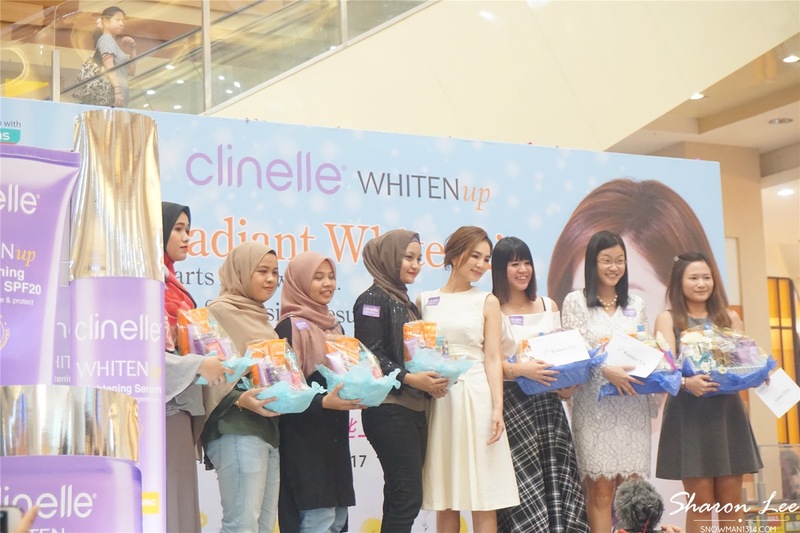 Do follow Clinelle for more updates on their latest news and events. In keeping with Clinelle's brand promise, CLinelle WhitenUp range has been proven to be safe and contains No Paraben. Therefore, is it suitable for all skin types including sensitive skin. 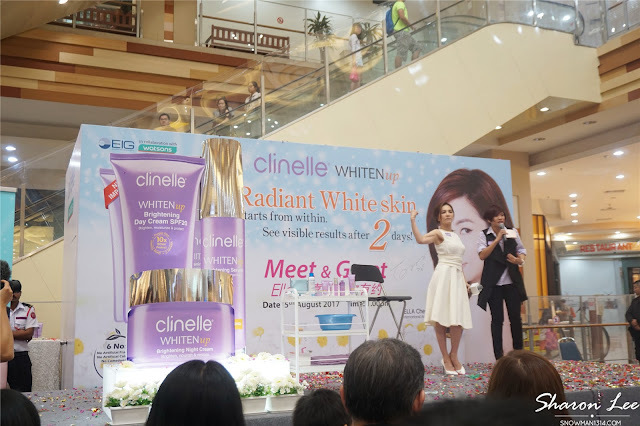 All Clinell products are dermatologically tested for its tolerance and also formulated with 7 secrets to Happy Skin which together excludes potential harmful ingredients: No Artificial Coloring, No Artificial Fragrances, No Lanolin, No Mineral Oil, No SD-Alcohol, No COmedogenic Ingredients and No Paraben. Fundamentally, all Clinelle products work effectively to free skin from rapid environmental aggression with RX3 Action to Repair, Refine and Reshield skin for optimized skin health and clearly visible and long-term results. 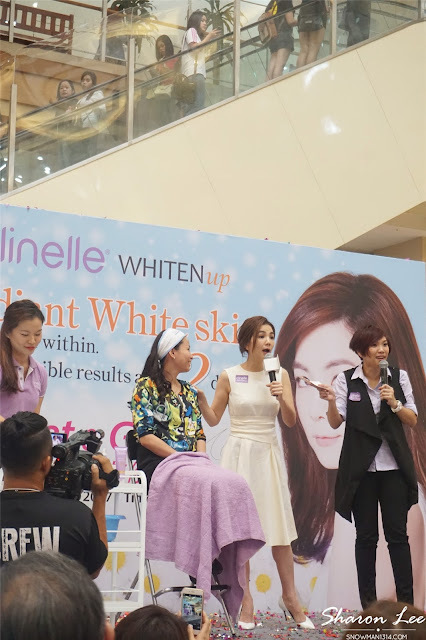 Clinelle WhiteUp Brightening range is formulated and manufactured from USA. i have few clinelle products, get it from joining event. But i didn't use it, give it to my sisters. So good, get to meet and see Ella.. nice brand and great launch! Ella is so slim even after giving birth. 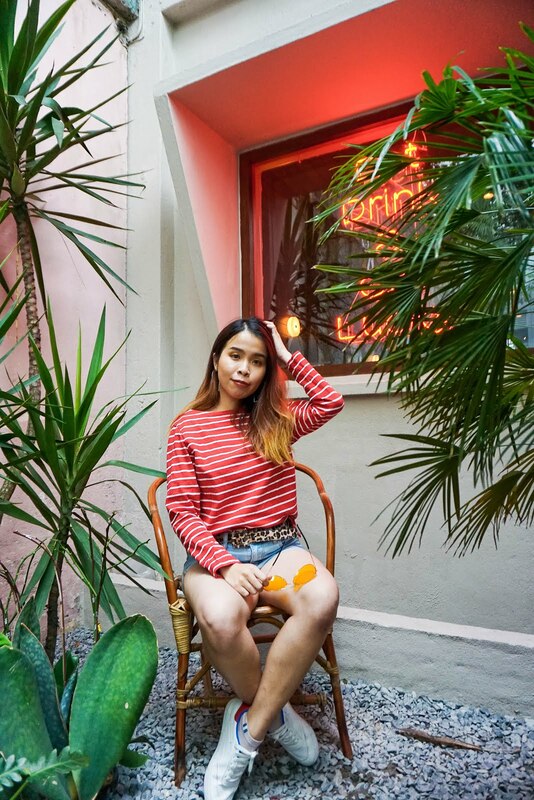 I've seen her before as well one time in Ipoh. BTW, love your matching outfit! Yes!! I was so jealous with her! Yes I love the color too. Have not yet try yet =P Coming soon! THE skincare price is affordable. I would love to try it after my current skincare finish. yes indeed =) haha time to use it! Wow..Ella seems very fun :) I have not tried Clinelle products before.. Thanks babe!! <3 Mee too! Didn't make it to the event because it was too far. Love your dress! She looks very cute and fun!! I like her already! !